I’ve mentioned before that my husband is a cake-baker extraordinaire. Sylvia always gets amazing birthday cakes, and this year was no exception. She requested “a fairy cake,” and Jan delivered. The outside was covered in green buttercream with piped-icing lilies of the valley (which were just starting to bloom in our yard during her party) on the sides and various fairy-garden-inspired ornaments on top. Jan prides himself on making sure that everything on his cakes is edible (with the exception of wooden support posts inside tiered cakes), which is why he uses fondant (blech) only if the cake recipient/client really wants it. He thought about making the top decorations out of marzipan, but didn’t have the time or materials on hand. So he used gum paste, which is technically edible but tastes pretty awful. We explained this to Sylvia, but this was clearly a case of “in one ear and out the other”: as soon as a hedgehog-bedecked slice of cake was placed before her, she popped the little gum-paste critter right into her mouth. Here she is, right before her face melted into an “oh, I don’t want to eat this and I wish I hadn’t put it in my mouth” expression. 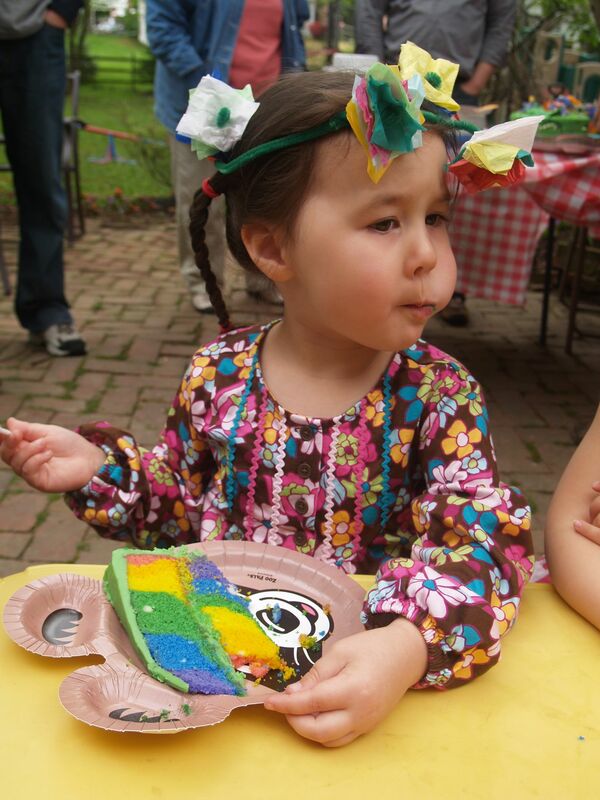 I told her she didn’t have to, so she very unceremoniously spit out a very chewed-up gum-paste hedgehog onto her plate, then happily dove right into the rainbow-colored cake! 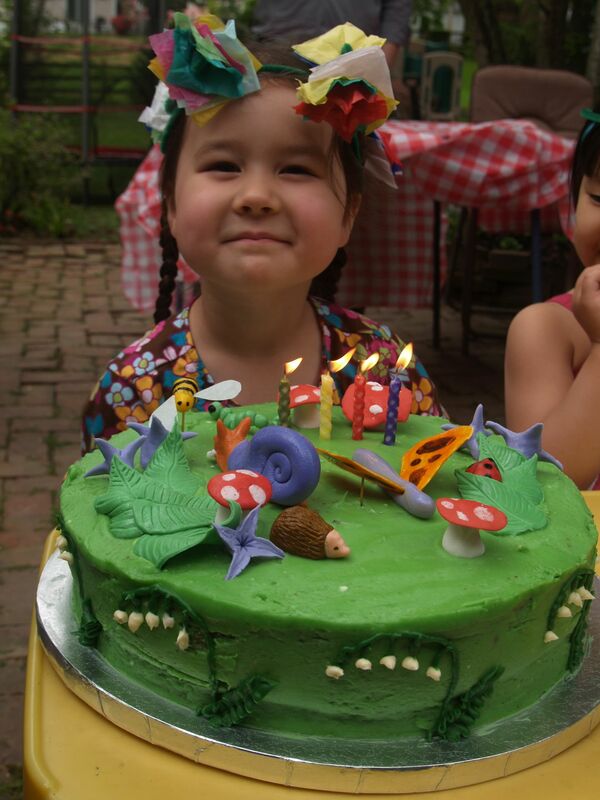 Beautiful girl & beautiful cake! The cake is amazing!! And the hedgehog was adorable. And the inside of the cake is rainbow, too? Fabulous! What a great cake! Not only is it pretty on the outside, but also on the inside. Sylvia looks like she enjoyed it too! What a lovely fairy cake!! Awesome cake, both inside and out! Could tell it was made with a lot of love. Happy birthday, Sylvia! Ahh, the cake looks fabulous and was! @Paula: Almost too pretty to eat—but not quite! We ate it all up! Happy belated birthday!! What a gorgeous cake!